Crash Bandicoot N. Sane Trilogy was a surprise hit for Activision, topping the charts at the time of its release and going on to sell over 5 million copies by some estimates. 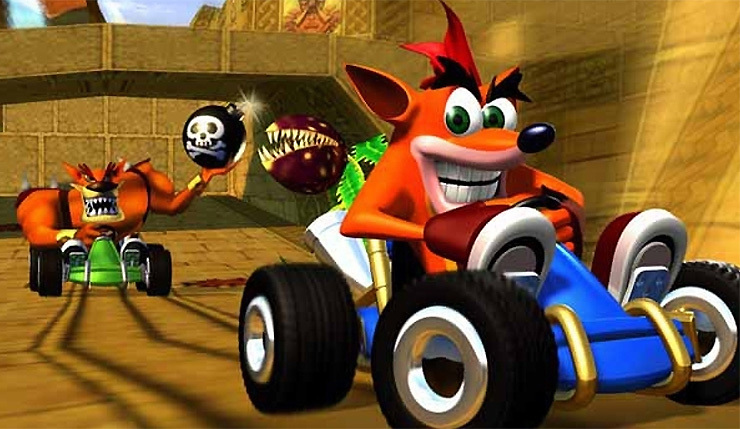 Almost immediately, Activision was hinting that more Crash projects were on the way, and N. Sane Trilogy developer Vicarious Visions even mentioned CTR: Crash Team Racing by name. Now, on it’s own a pair of orange fuzzy dice may not mean much, but the font on the card and overall composition of the image is very reminiscent of this teaser from last year. That ended up being a tease for Spyro Reignited Trilogy, so it seems likely something similar is happening here. The fuzzy dice could be a car reference, and, of course, they’re Bandicoot orange, so a Crash Team Racing reveal at The Game Awards 2018 seems like a pretty safe bet. It will be interesting to see what Activision does with Crash Team Racing. The success of N. Sane Trilogy was largely due to the title’s great value – three full critically-acclaimed games for a budget price! There have been three Crash racing games (Crash Team Racing, Crash Nitro Kart, and Crash Tag Team Racing), but the latter two games were pretty mediocre. But hey, the original Team Racing was great, so maybe it can carry the whole package on its own. What do you think? Looking forward to the return of Crash karting? The Game Awards 2018 take place this Thursday (December 6).